Condition: Hardcover, with dust jacket. Dust jacket torn at the back but intact and bright. Pages clean. Binding tight. 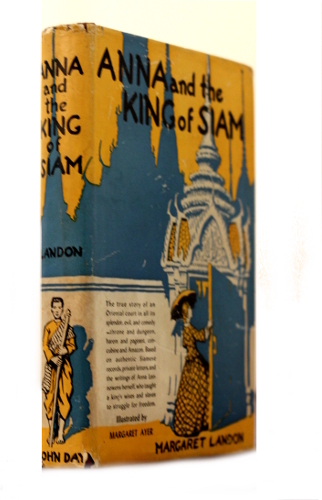 Anna and the King of Siam is a 1944 semi-fictionalized biographical novel by Margaret Landon. In the early 1860s, Anna Leonowens, a widow with two young children, was invited to Siam (now Thailand) by King Mongkut (Rama IV), who wanted her to teach his children and wives the English language and introduce them to British customs. Her experiences during the five years she spent in the country served as the basis for two memoirs, The English Governess at the Siamese Court (1870) and Romance of the Harem (1872). Landon took Leonowens’ first-person narratives and enhanced them with details about the Siamese people and their culture culled from other sources. The book has been translated into dozens of languages and inspired a 1946 film of the same title, the 1951 stage musical The King and I and related 1956 film musical The King and I and the 1999 film Anna and the King. At the time of its publication, The New York Times called it “an inviting escape into an unfamiliar, exotic past . . . calculated to transport us instantly.” Atlantic Monthly described it as “enchanting” and added, “the author wears her scholarship with grace, and the amazing story she has to tell is recounted with humor and understanding”.